Each year the Central Ohio Chapter of the Penn State Alumni Association awards a scholarship to a deserving incoming freshman from the Central Ohio area. All funds in our scholarship account come directly from the support of local alumni and friends. The award is named after one of our most distinguished area alumni, Frank Ingram ’63 Med, ’66 DEd, who was the driving force behind its establishment in 1996. 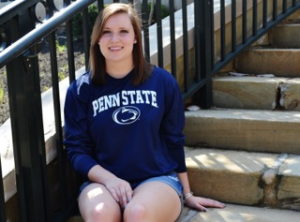 The Central Ohio Chapter of The Penn State Alumni Association has awarded the group’s 2018 Franklyn Ingram Spirit Scholarship to Makinley Cramer. 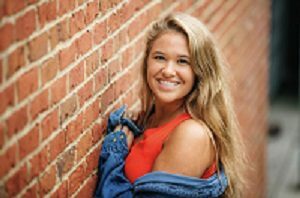 Cramer is a 2018 graduate of Granville High School and will attend Penn State’s University Park Campus. Makinley is the daughter of Tiera and Bryan Cramer. At Granville High School, Makinley was a member of the basketball and volleyball teams. She was involved in Student Council, Youth and Government, Varsity G Club, Latin Club, Interact and several theatre productions. The $2200 award is designed to benefit a deserving Central Ohio student attending Penn State. The scholarship is named in honor of the late Dr. Franklyn C. Ingram who earned his masters and doctorate degrees from Penn State. Dr. Ingram was a long time chapter member and a driving force behind the scholarship. Those wishing to contribute to the scholarship can find more information at the chapter’s website; psucolumbus.org. 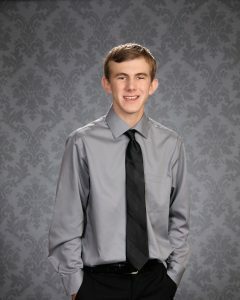 Congratulations to Braihan Beckel, our 2012 scholarship winner on his graduation from Penn State! He accepted a full-time job in New Jersey and started in July 2016. 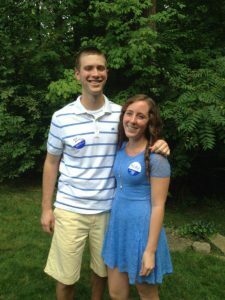 Our 2012 (Braihan Becke) and 2013 (Rebecca Puckett) Scholarship winners at the Penn State Picnic and Student Send-off, August 2013. 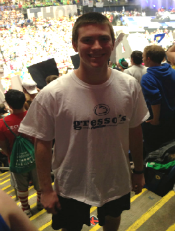 Our 2012 scholarship winner, Braihan Becke, at THON. Our 2015 Franklyn Ingram Spirit Scholarship winner, Melissa Martin of Blacklick, Ohio. 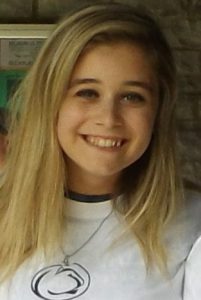 Morgan Handmaker of New Albany, Ohio, our 2016 Scholarship winner. Alexander Groger from Olentangy Orange High School, Ohio, our 2017 Scholarship winner. Makinley Cramer from Granville High School, Ohio, our 2018 Scholarship winner. Each year Central Ohio Chapter of the Penn State Alumni Association awards a $2,200 scholarship to a deserving incoming freshman from the Central Ohio area. All funds in our scholarship account come directly from the support of local alumni and friends. The award is named after one of our most distinguished area alumni, Frank Ingram ’63 Med, ’66 DEd, who was the driving force behind its establishment in 1996. When can I apply for the Chapter’s scholarship? Thank you for your interest in our Chapter’s scholarship & congratulations on being accepted at Penn State. Penn State’s admissions department sends us a list of final acceptances to Penn State sometime in June. We then send emails to the incoming freshmen with information on how to apply for the scholarship. When do you award the scholarship? Our scholarship board meets in late July or early August and reviews the applications and then awards the scholarship. If you any questions, please contact Bob Remy (rremy@columbus.rr.com) or Anita Lombardo (lombaral@yahoo.com). Are you interested in donating to our Scholarship Fund? The Penn State Central Ohio Alumni Chapter welcomes and appreciates all donations to the scholarship fund. All donations are tax deductible within the guidelines of Section 501c (3) of the IRS code. Your donations help our fund grow and thus allow us to provide scholarship awards each year to a deserving student. Contributing to our scholarship fund is simple. You can donate either by check or by using our online store to donate online. To donate by check, please send a personal check, made payable to “PSUAA – Central Ohio Scholarship Fund” and email psucolumbus@gmail.com for the address information. Please note the amount of the donation on your remittance: $25, $50, $100, Other. To donate online, please go to our online store and select the Scholarship Fund Donation amount that you would like to contribute. If for any reason you have questions or would like to learn more about our Scholarship Fund, please email our Chapter Scholarship Coordinator. We thank you for your support!